For conference, exhibition and events, see full scehdule below. 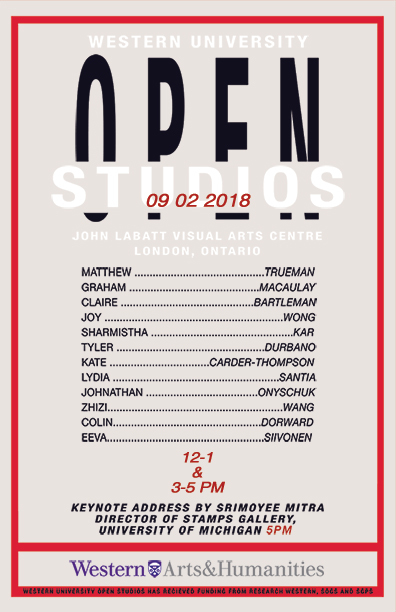 The Department of Visual Arts Graduate Students at Western University invite you to attend the 2018 edition of Open Studios and the Graduate Conference: INWARD>OUTWARD: (De)constructing Experiences in Public Spaces. Tour our MFA and PhD studio spaces in the John Labatt Visual Arts Centre, and meet our student artists. This year, the event will coincide with the ArtLab exhibition Inward Outward. The two-day event begins with the opening reception of Inward Outward, an exhibition in the ArtLab Gallery guest curated by MA candidates Regan Brenner and Madelaine Tripp, from 5pm to 7pm, Thursday February 8th. Following the reception will be the first keynote address by Andrew Hunter (Senior Curator at Art Gallery of Guelph, educator, artist), as part of the Art Now! Speakers’ Series. Friday February 9th begins at 10am with panel discussions on this year’s theme Inward Outward. Panel discussion topics range from Identity and the Body, Public Spaces, Virtual Spaces, and Challenging Perception. Panel discussions go until 3pm, with an hour break at 12pm during which Open Studios would take place. Open Studios will continue again from 3pm to 5pm. The second keynote address by Srimoyee Mitra (Director of Stamps Gallery, University of Michigan) will take place at 5pm.